Need a new birthday treat? 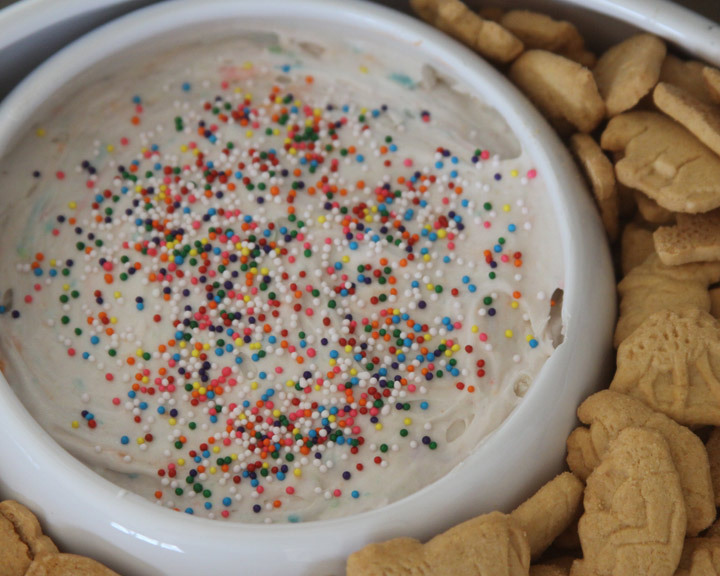 This Cake batter dip is fun and delicious. By combining a few simple ingredients you have a festive birthday treat that tastes fabulous and is way easier than baking a cake. I simply cannot believe that my very first baby is turning 5 today. In honor of my sweet little guys birthday I wanted to share with you a super simple recipe that he LOVES! What a fun alternative to the usual cupcake birthday treat! This was a fun recipe that I found on Pinterest via Tasty Kitchen . The very first time I made this we were all head over heels for it. It is so quick and easy to throw together and makes a great treat for any occasion. My son and husband especially couldn’t get enough of it. It makes a pretty good amount of dip, so I usually take one batch to a function and freeze the other half for another special occasion. Then when I need a quick treat I can pull it out of the freezer and thaw it and I have an instant crowd pleaser. I was worried that it wouldn’t freeze well because of the yogurt so I did a little research, and found out that it was a-OK to freeze yogurt. After freezing it tasted great. The original recipe says you can use any type of cake mix, but I really love the flavor that the party rainbow chip cake from Betty Crocker gave the dip. 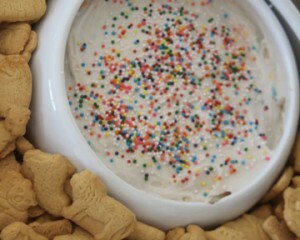 It also already has little colorful sprinkles in the mix, so no need to add any to the dip. It is a great alternative since the color runs if you add sprinkles after and refrigerate it . I just top the dip with a few extra sprinkles before I serve it! Stir first two ingredients together in a large bowl until combined. Fold in Cool Whip. Chill for at least one hour. Cover dip with sprinkles before serving. Stores in the refrigerator for 3 days and can be frozen. Since the birthday boy is in charge of providing the snack for his preschool class today I let him choose what he wanted to take, and lucky me, he decided he wanted cake dip! We made a quick batch together and then put a couple spoonfuls into little containers so each child had their own little helping. 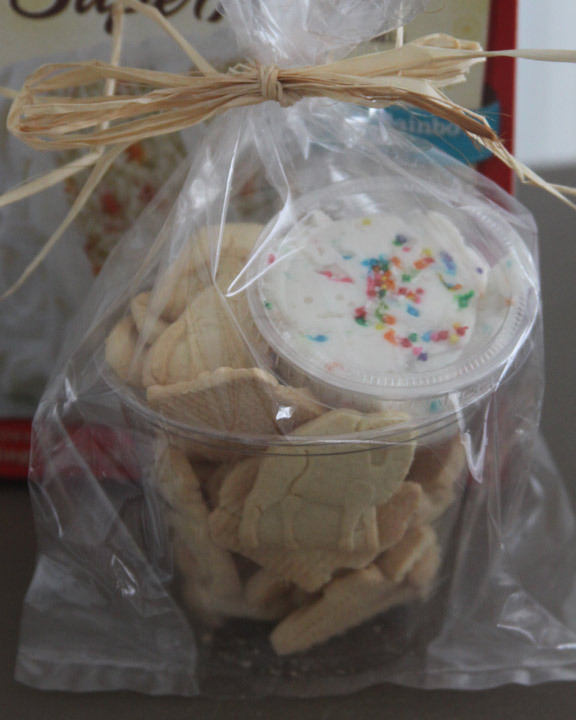 We filled clear plastic party cups with animal crackers and put the cake dip on top. We added the treat to a little bag with a raffia bow and were done. I thought this would make it easier for the teachers to hand out to the kids and a super special birthday treat for Kyle to share with his friends at school. I am so happy to have made this fun treat with my little guy to celebrate his 5th birthday. He has made every single day of the last 5 years of my life the most amazing yet, and has moved me beyond words with his kind heart and precious smile. Love this idea-doing this for annual Easter egg hunt and classroom. Thanks! Love the sound of this recipe but being from Scotland I am not sure what cool whip is. Can anyone help? its an artificial whipped cream, you can find it in a tub usually in the freezer section at the grocery store. I absolutely love this idea!!! Sounds delish!!!!!!! Can wait to try it!! Do you need to keep the dip refridgerated? Do you follow the directions to make the cake up….or just use the mix with no added ingredients??. Looks good….want to try for a birthday treat! no – do not make the cake – just add the mix with the other ingredients in the recipe! Containers can also be found in restaurant supply stores or on Amazon dot com. I use all sizes (clear) for leftovers in refrigerator and use the smaller sizes for salad dressings in lunch boxes. They stack well and take up less storage space in my cabinet, too. Can you please tell me where you found the little containers for the dip? How many little containers did this make? I bet it would make 40 little cups or so. I made about 20 little cups for my son’s class and had a pretty good amount left over. Switch out the plain yogurt for vanilla .. even more delicious!!! What do you serve with this dip other than animal crackers? What does your husband like with this dip? Nilla wafers, graham crackers, or sugar cookies would be great alternatives! I made this tonight and have to say it’s AWESOME!!! Had rave reviews – will make it again! 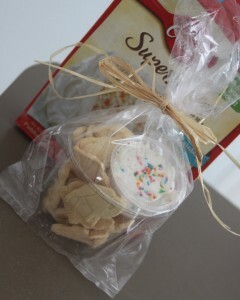 Made for my sons class on his birthday, served with mini vanilla wafers and pkgd just like picture and was a huge hit at school!! Something new for a change and kids loved it! I live overseas and sometimes I have to be very creative to obtain a similar result. Beside the sprinkles, can I use something else? Maybe crumble oreos? Can you please give me some alternative for the adding decorative stuff? I will have to make it with regular vanilla cake mix since there are not Betty Crocker where I live. I appreciate any ideas…Thank you and please keep sharing these cute options with us! How long can this freeze for? My daughters first birthday is at the end of February and we are doing a circus theme. This would be an adorable alternative to loot bags. Is this 1/2 c or 1 &1/2c of yogurt? I’m just A.little confused to the directions. I’m sure its 1 & 1/2 cups of yogurt. You would need that much to wet the cake mix.. I have been waiting for my son’s birthday to make this! We are looking forward to trying these out for his birthday on Wednesday to send to class. I love the idea! This sounds delish… But I’ve heard it’s not great to eat uncooked flour. Rare, but like raw eggs you can get sick. Maybe cake mix is different?